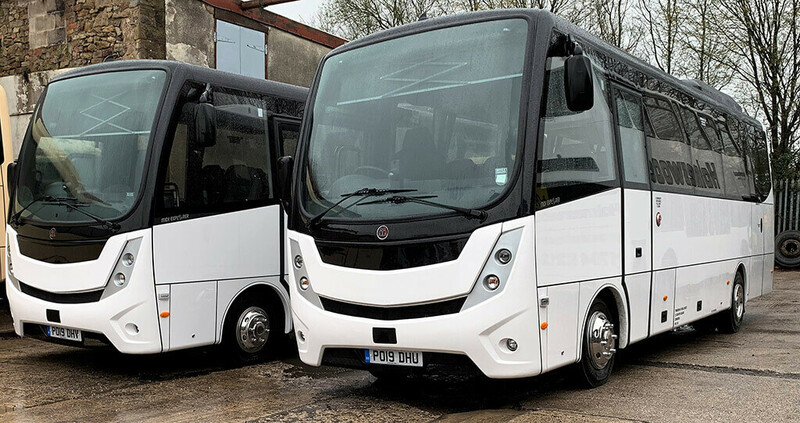 BASE Coach Sales of Leyland, Lancashire have supplied Timberbush Tours of Edinburgh with two further new vehicles for the fleet as part of its investment in 16 new vehicles during 2019. The two MOBIpeople Midi Explorers are based on the MAN TGL 10.220, which is to Euro VI standard and puts out 220bhp through a six-speed automated ZF Ecolite gearbox. The 2.35m width is ideally suited to the narrow rural roads that the vehicles will be operating on whilst touring remote areas of Scotland. The 9m length allows for 32 Kiel reclining seats, USB port’s to all seats, Bosch dial zone PA and audio system and with the Midi Explorer being front-engined, 4 m³ of luggage space. Double glazing is fitted as standard, as is air-conditioning. The vehicle also comes with two years manufacturer’s body warranty. Timberbush Tours are currently in the process of expanding its fleet to 34 vehicles during 2019. The multi-award winning company provides one, two, three and five day tours of the Scottish Highlands and Islands with daily departures from Edinburgh, Glasgow and Inverness.